Airbnb teamed up with VICE Media and wanted to showcase their new VICE experiences offered through Airbnb. 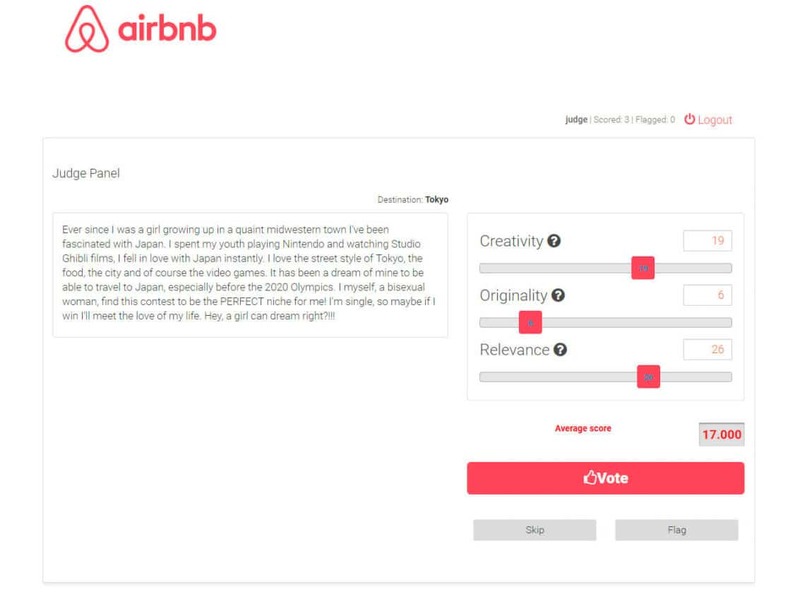 Airbnb wanted users to have a fun experience and share why they are passionate about the experiences offered by VICE, while also encouraging more registrations into the Airbnb rental platform. Airbnb planned to run an essay contest on its Airbnb platform. New and existing Airbnb account holders would submit a short essay explaining why they are passionate about the four VICE experiences being showcased. The contest would be open across the world in nine different countries, with the winners selected by a team of Airbnb and VICE judges. 100 winners would each win round trip airfare and transportation to one of four of Airbnb x VICE experience destinations: Cape Town, New York City, Paris, or Tokyo. All submissions must be moderated for content and eligibility before winners can be selected. Contest Factory designed and implemented an administrator platform for Airbnb capable of handling the moderation and judging needs for the tens of thousands of submissions received for the contest. The platform was able to sort out all the submissions received by country and automatically reject any submissions received outside of the eligible countries. Airbnb judges would then be able to login and either flag a submission for disqualification due to content, or score the submission based on the three criteria specified in the official rules. A large number of Contest Factory moderators and expert judges reviewed and scored tens of thousands of essay submissions and delivered the list of hundreds of finalists to Airbnb and VICE judges to select the final winners. Contest Factory’s Viral DNA analytics software provided Airbnb with real-time data on the number of submissions per eligible country, disqualified submissions, the judge scores received by each submission, and the number of submissions each judge evaluated per day. On Airbnb’s behalf, Contest Factory also administrated the prize fulfillment of the contest and organized the trips to the VICE experiences in Cape Town, New York City, Paris and Tokyo for all 100 winners within 2 weeks after the promotion ended. The contest was a great success for Airbnb as it saw an increase in account registrations during the contest period, with almost 10% of all submissions coming from brand new Airbnb accounts.